The Optoma DH 350 offers Big Screen Entertainment that is convenient and easy to setup , the bright and versatile DH350 boasts Amazing colour technology and conforms to Rec.709 delivering accurate true to life colour reproduction.. This small projector is ideal for watching live sport, TV shows or movies any time of day on a big screen. You can even connect your games console and play games on it with its low input latency. Optoma projectors can display true 3D content from almost any 3D source, including 3D Blu-ray players, 3D broadcasting and the latest generation games consoles. An integrated speaker provides you with great sound and two HDMI inputs enables an easy setup. Perfect for connecting a laptop, PC, Blu-ray player, media streamer or games console. You can even turn it into a smart projector by connecting a HDMI dongle like the Google Chromecast™, Amazon Fire TV or Apple TV™ to play games, stream videos and share photos on the big screen in the comfort of your own home. Weighing less than 2.87kg you can take it round to a friend’s house with the optional carry bag for a sports event, movie night or games marathon for the best big screen experience anywhere with a flat surface. 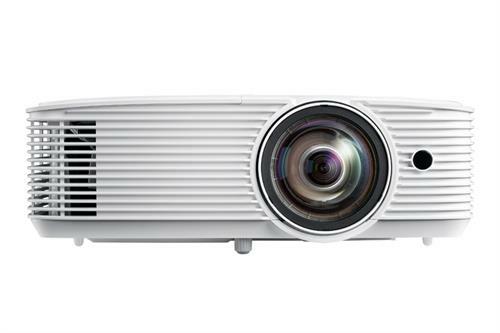 The X308ST is feature oriented projector, specially designed for business and education environments. This bright short throw projector has precision optics with an bright light source engineered to handle ambient light conditions. Essential capabilities such as USB power and network connectivity for more flexible operations are included. 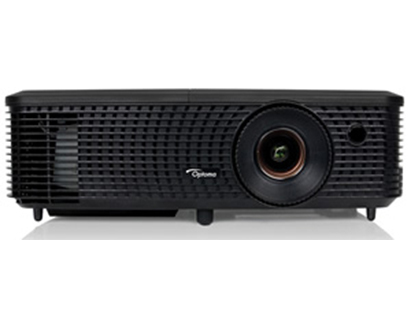 The Optoma X341 Lightweight and portable XGA Multimedia 3D DLP Projector is suitable for use in environments such as schools, conference rooms, and more. 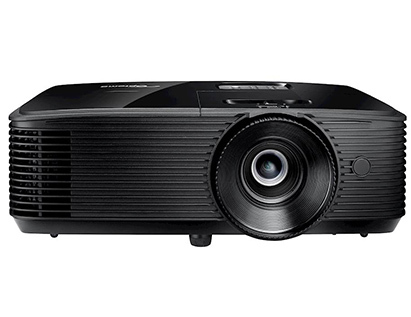 It delivers 3300 lumens of brightness with a notable 22,000:1 contrast ratio. The X341 has a XGA 1024 x 768 native resolution for viewing detailed content. 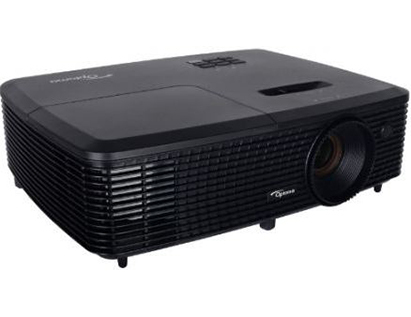 This projector is powered by a DLP chip system, and the lamp features a long life of up to 10,000 hours in Education cycle mode. 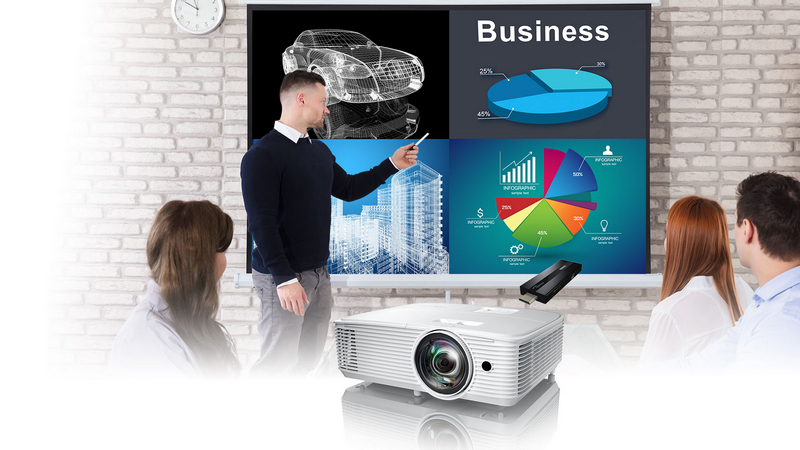 The X341 is also equipped with BrilliantColor technology, which provides multi-color processing for accurate reproduction to deliver larger-than-life engaging presentations with superior image clarity, easy-to read text and graphics and vibrant, accurate colors. The Optoma X341 provides flexible analog and digital connectivity for maximum compatibility with all your sources, includes HDMI v1.4a with Full 3D capability, VGA-in, VGA-Out Audio-in, Audio-out, USB type-A , 1.1x zoom lens, 2W audio with excellent tonal balance, RS232 control, remote control. This projector is easy to connect to with multiple inputs, a built-in speaker and USB Power. Perfect for connecting HDMI dongles such as the Google Chromecast and the Optoma HDCast Pro (sold separately) or a laptop, PC or Blu-ray player for clear projected images with sound. 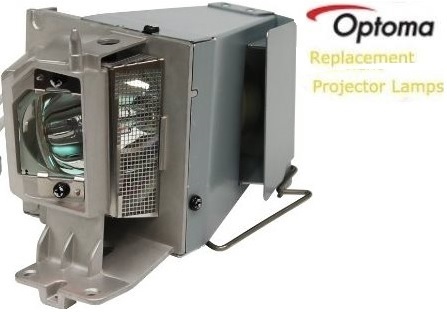 This portable and lightweight projector can be installed or taken on the move and is Ideal for use in conference rooms, training rooms, classrooms, houses of worship and digital signage applications. Project bright vibrant presentations effortlessly any time on day. Designed for meeting rooms and classrooms, the S331 boasts sRGB accurate true to life colour reproduction, long lamp life and energy-saving features to provide you with a low overall cost of ownership. This projector is easy to connect to with two HDMI inputs, MHL, USB Power and a built-in speaker. Perfect for connecting HDMI dongles such as the Google Chromecast and the Optoma HDCast Pro (sold separately) or a laptop, PC or Blu-ray player for clear projected images with sound. Portable and lightweight projector can be installed or taken on the move for off-site meetings with the optional carry bag (sold separately). Turn your projector into a smart projector and share content on a big screen wirelessly. 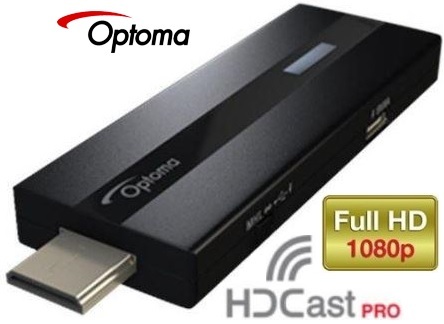 The Optoma HDCast Pro is lightweight and portable, easily fitting into the side pocket of a backpack or front pants pocket enabling you to stream digital media content , videos and music, and share photos and documents in Full HD 1080p from your smart mobile device or laptop directly to Optoma projectors or any HDMI enabled HDTV with ease anywhere, anytime. Use the included Document Viewer to effortlessly share Word documents, Excel documents, and PowerPoint presentations or utilize HDCast Pro's Cloud Storage to access documents, presentations and audio video files.The Document Viewers Live Draw allows any presenter to make annotations to any document for everyone in the room to see. 4-Way split screen presentation mode enables the moderator to allow 3 participants to mirror or cast content from their Android, iOS or Windows devices directly to one of 3 available quadrants. This feature is great for meetings, training sessions, and classroom lessons where more than one participant may need to show content to those in attendance. -Instantly stream live camera footage to a projector or display from your mobile device. 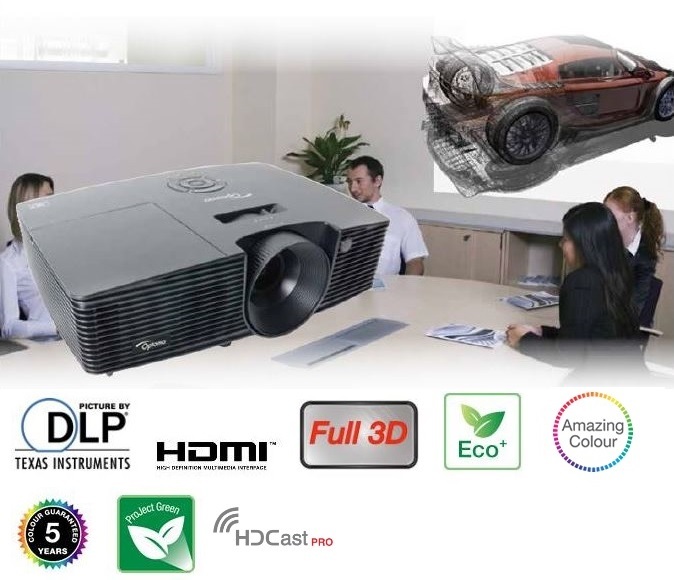 -Connect MHL enabled projector or display without the need for external power.